Sometime back,during my regular blog hopping,I happened to read a post on a Tam-Bhram blog about the special foods prepared to welcome the new son-in-law to the family,I was intrigued.I have heard about the feast for "puyaaplah",which literally means new son-in-law in Kerala Muslim families,but this was something new.If I remember correctly,Urulai Roast/Potato roast is a very popular dish in this regard. Now being a potato lover,I was all ears eyes and searched many blogs for a recipe which I could try.Almost all the recipes sounded very similar,in fact looks like I already tried out a version some time back.Keeping this is mind I got a bag of those cute baby potatoes,specifically for the blog.Now come on,they look better any day than sliced/cubed potatoes,don't they? 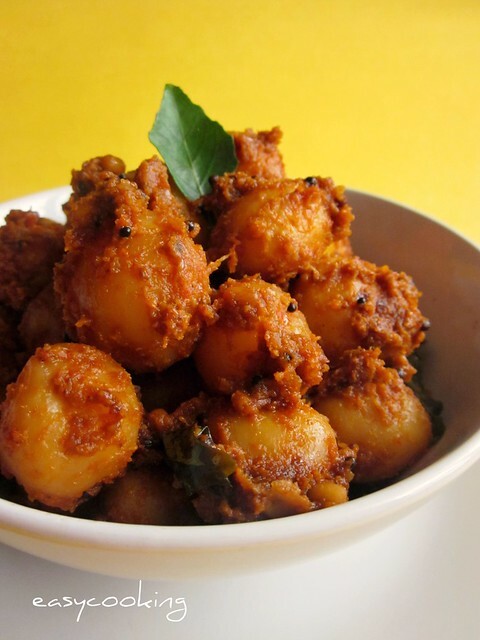 The recipe is quite simple and straight forward.Half boil the potatoes and roast with spices/masala.It cannot get any easier than that.Whether or not you are trying to impress someone,this makes a great addition to your food plate,that I can guarantee!! Cook the potatoes in the pressure cooker for about 10 minutes or 3-4 whistles. Let it cool,peel them and keep refrigerated to firm up. Make a paste of onion and tomatoes,keep aside. In a non-stick kadai add oil and splutter mustard seeds and urad dal.When the urad dal starts browning,add curry leaves and the onion-tomato paste. Keep stirring for 3-5 minutes and then add the powders-chilly,coriander and haldi. Stir for about 2-3 minutes or till the raw smell of the masala subsides. 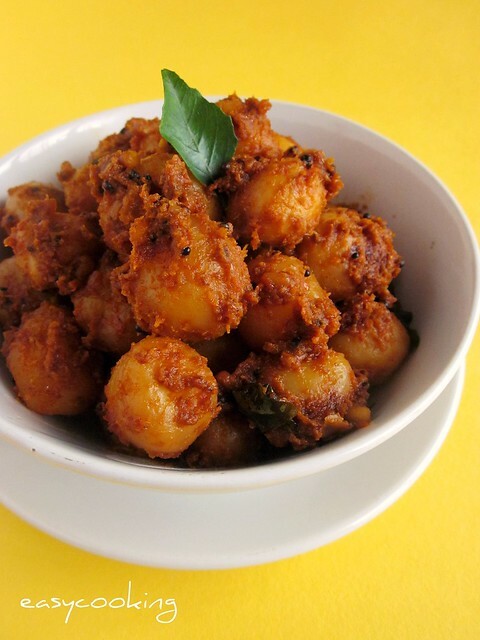 Tip in the potatoes,add salt to taste and mix well so that the masala coats the potatoes. Keep on simmer for about 15-20 minutes and stir once in a while taking care not to mash/break the potatoes. Switch off the flame when the potatoes are evenly roasted and coated with the masala. You could substitute baby potatoes with normal ones.Just cut them into big chunks and proceed with the recipe. It is preferable to use a non-stick kadai as it requires less stirring and doesn't get stuck to the bottom.More stirring would cause the potatoes to mash/break.It would not affect the taste in any way though. The spice powders can be substituted with Sambhar powder for a different and more pronounced flavor. the baby potatoes look absolutely scrumptious !! You can never go wrong with potatoes(shining new son-in-law included!). Its really a life saver when you don't food preferences of people. The ground tomato paste here ups the yumm factor here! wow, iam drooling.. 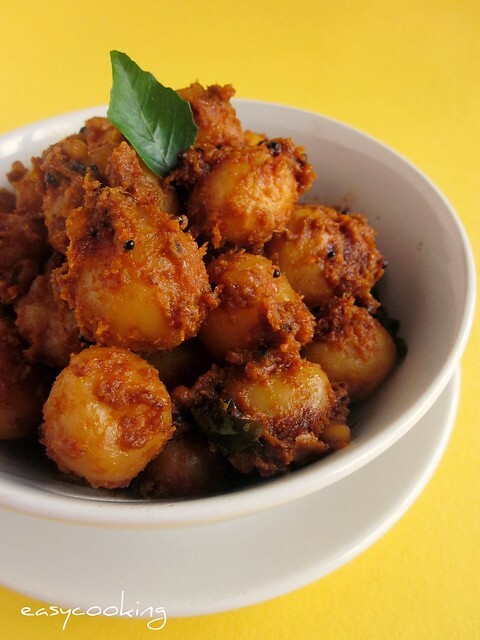 Potato is well coated with masala.Lovely recipe.bookmarked !! Baby potatoes look truely delicious....loved dis version..yummy!!! Clicks are perfect. These baby potatoes are really cute. Woww wat a click, real feast to eyes...Truly delicious roast..
Glad you liked the recipe - those are some great pics. Just a thought - if I don't change the ingredients and recipe to a large extent - I usually end up just linking the original recipe instead of writing it out again in my own words. Cheers. awesome !! luved the finger licking masala on those tiny pototaoes...truly yum ! Lovely pic. Amma makes a version with a curd marinate and the same powders. These give a lovely tinge of roast. Do try! Classic recipe,looks wonderful and drooling at the cute potatoes made into a yummy roast! This is food for the soul. Absolutely. I can never say no to this. And I'm totally craving for this now. "Make a paste of onion and tomatoes,keep aside." Can you elaborate for newbies. "Make a paste of onion and tomatoes,keep aside.". Please elaborate this step for my sake (newbie). Apam Nipat--Chop the onion and tomato into big cubes and make a paste of it by putting in the mixer.Use that paste during the seasoning.Hope this helps.